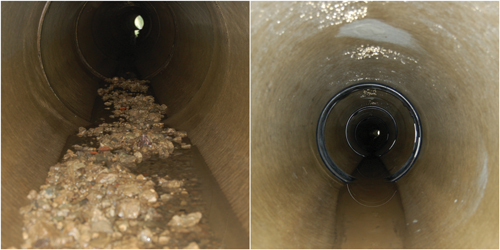 Awater utility asked HydraTech for a long-term solution to infiltration at the pipe joints of a 27-in. storm drain. The company proposed using the HydraTite internal joint-sealing system, which is a quick and inexpensive method of sealing cracks from inside a pipe. It selected standard 27-in.-wide ethylene propylene diene monomer rubber seals with two one-piece stainless steel retaining bands. Prior to installation, HydraTech removed debris and soil from the defective area of the storm drain. Ten seals were installed two days. The client was pleased that all infiltration was eliminated through a method that allows for pipe movement as settling occurs over the years. The joint repair method is recognized by the American Water Works Assn.’s M28 criteria. Since 1982, more than 30,000 systems have been installed and are still in service around the world.